SALT LAKE CITY (AP) — Linebacker always seemed to be the ultimate destination for Chase Hansen at Utah. Entering his senior season, Hansen finally made the move. With tons of depth at both safety positions, and a hole to fill at linebacker, another position switch made sense for him and Utah’s defense. Becoming a linebacker has elevated Hansen’s game and helped Utah’s already fearsome defense reach another level. He has played an important role in getting the No. 17 Utes to their first Pac-12 championship game, where they will face No. 10 Washington on Friday night. The senior is a contender for Pac-12 defensive player of the year after collecting 101 tackles, five sacks, four pass breakups, two interceptions, and a fumble recovery through 12 games. 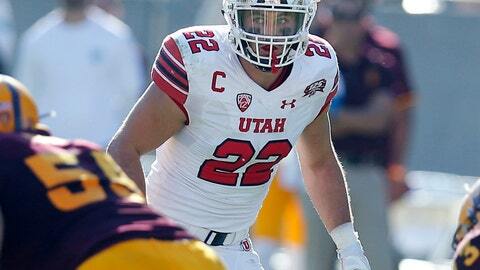 Hansen is Utah’s top tackler and leads the Pac-12 with 22 tackles for loss. He is tied for third in the league in sacks. “More than anything, I like to finish a game feeling like I did my job and I helped the team win,” Hansen said. Hansen had specific goals in terms of numbers he wanted to put up and plays he wanted to make when he switched to linebacker. His biggest goal, though, was staying on the field and putting himself in a position to be a team leader and key contributor to Utah’s success.